You would think that a film which American cinema icons, Frank Capra and Jimmy Stewart, considered their personal favorite would have been a certified box office success. However, for their film, It’s A Wonderful Life this was hardly the case. Released in 1946, the film barely recovered its cost, and was quickly forgotten. Yet, today it is considered an American film classic. Ranked #11 on AFI’s list of the 100 greatest American films, it has become a part of our cultures Christmas tradition. All this begs the question, how did this transformation happen? What is the story behind this story? It all begins in 1939 when director, Frank Capra, purchased the film rights to a two-page outline for a short story called The Greatest Gift. At the time Capra was quoted as saying, “It’s the picture I’ve waited all my life to make.” At the start of shooting, both Capra and Stewart were concerned that because of their five year hiatus from filmmaking due to the war their magic together may have faded. However, they quickly picked up where they had left off after Mr. Smith Goes to Washington and were convinced they had created a box office winner. The film made its debut in December. After a short run, the film was forgotten and put on the shelf where it sat for 25 years. In 1971, due to a clerical oversight, the film began its journey to becoming an American classic. Someone forgot to renew the copyright! The film now became part of the public domain, which meant anyone could run it at virtually no cost. Initially it was public television that picked up on the film. Audience response was immediate, and soon every broadcaster with a signal was airing the film. This increased exposure and repetition were the first steps in launching its journey to become an American classic. Today, most Americans have watched “It’s A Wonderful Life” at least once. I am one of the many who watch it every Christmas, often inviting friends over to share the experience. Steven Spielberg watches it every time he starts work on a new film. So, how did this happen? Let’s start with the medium itself. The moving image remains the most powerful communications tool available to storytellers. Combining the elements of sight, sound, motion, and emotion, it activates multiple parts of the brain through simultaneous sense stimulation. When you combine this powerful medium with a compelling story, you have all the ingredients for effective brain activation and an associative experience which will be stored in long-term memory. We know that visual information goes from the retina to the thalamus. The thalamus acts as a sort of ’switching station’ sending the incoming information to all parts of the brain where that stimuli may be relevant. The most important of these is the neocortex where knowing actually occurs. From the neocortex, signals are sent to the proper associative parts of the brain such as the visual and auditory areas. At this time, the amygdala and hippocampus, where subconscious long-term memories are stored, are also engaged on a parallel circuit. The hippocampus puts the story into context and decides if the amygdala should respond. If emotion is involved the amygdala is engaged. It is now known that when in a dangerous or fearful situation, the thalamus may engage the amygdala directly. In watching It’s A Wonderful Life this is unlikely; although characters in the film may have experienced this. For example, when young George Bailey sees his younger brother fall through the ice and responds immediately to rescue him. No matter which circuit the information travels, we know it does so through the neural network. Neurons last a lifetime and are responsible for all brain activity. They connect to each other through dendrites, which take in information as electrical energy. This energy is transferred through the cell body down through the axons where electrical energy is converted to chemical energy. This chemical energy enters a canal or synapse where, if excited, it activates another neuron. Through this process, or sprouting, entire networks are created. These networks can grow, become more tightly connected, and create mood. This process is a scientific fact. Through it you can literally change someone’s mind. This power to change a mind is enhanced when emotion is attached to the information entering the brain. In fact, the amount of emotion attached to the information will determine how deeply it is stored in memory. The degree to which we change a mind is determined by how well we tell our story. Story is the chronicle of change. 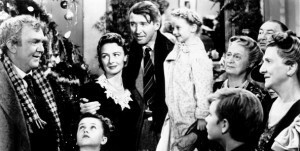 In the film It’s A Wonderful Life we experience the journey of George Bailey’s life from a nine-year old boy to a middle-aged man with a wife and four kids. Not only do we see George negotiate life’s inevitable changes but also share the life experience of an entire cast of colorful characters. The film plays out like a great book. Each scene stands as a chapter that ends in a defining moment, and all the elements that make for a great story are present. The pre-sensory elements include compelling characters, a clear sense of journey, and a setting that creates a well defined context that stimulates numerous associations within the audience. The journey of It’s A Wonderful Life is the journey of life itself. The vast range of human emotion, human behavior, and human experience are all present in this film. This is what I think makes the film so powerful. We can’t help but relate this film to our own lives. And we know that true understanding is only attained through shared experience. The sensory elements of story are also quite palpable. Our lives are about problem solving, and It’s A Wonderful Life is filled with problems to be solved. Also, there is a clear goal; improving one’s life experience. And a universal theme; the quality of our lives is closely related to the quality of our relationships. There is also an interesting connection between journey and scene in this film. While the film depicts the totality of a life’s journey, it does so within a single setting; the classic American small town. Perhaps what has made this film so compelling to all of us is the way it stimulates us to process our own scenarios in relationship to this story. 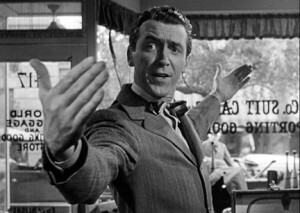 It’s A Wonderful Life is filled with classic American story-lines and classic American characters. It serves as a catalyst for us to reach into our memory to search for the many labels we can attach to the universal elements of this story. Stories give life to past experience. Stories make the events in memory memorable to each of us. The more indices we have for a story the more places it can reside in memory. It’s A Wonderful Life comes with many indices. We use these indices as the link from label to script. The linking of scripts creates something new. By linking multiple scripts, we create scenarios which stimulate remembrance. It’s A Wonderful Life helps us to remember. More powerfully, It’s A Wonderful Life helps us to remember with a great deal of emotion. The more powerful the emotion the greater the process of scenario, and the greater the impact on our memory. The processing of scenario is consciousness, and this process is weighted or modified by emotion. Emotion causes our mind to select certain streams of information over others. In essence, feeling the story is as important as knowing the story. All great storytelling ends with a call to action. Ideally we have been inspired to improve the quality of our own experience. Each time I watch this wonderful film, I am reminded to examine my own life. to check in and see how I myself am doing. In this, It’s A Wonderful Life serves not only to entertain me, but also to assist me in writing the next chapter of my life.